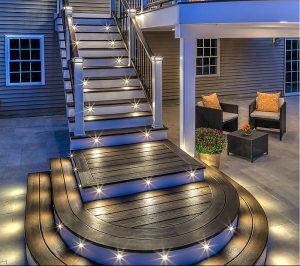 After dark is when your patio space can really become magical. All it takes is the right lighting! 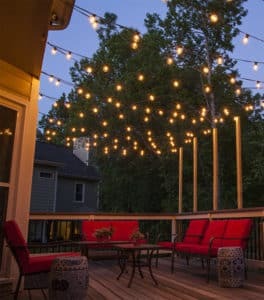 Today we’re going to get inspired by 15 outdoor patio lighting ideas that’ll really enhance your outdoor space, making it enchanting, cozy, and above all, welcoming to both you and your guests! 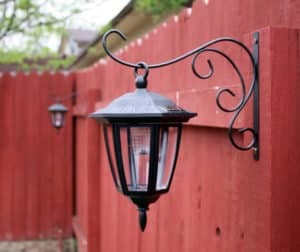 We’ve chosen a fun assortment of outdoor patio lighting ideas that include several DIY projects, a few professionally built-in ideas, and many lighting fixtures you can install yourself at a very low cost. We hope you find something inspirational! 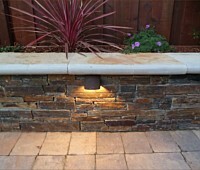 Rope Lights are a great way to illuminate or define special features in your backyard. 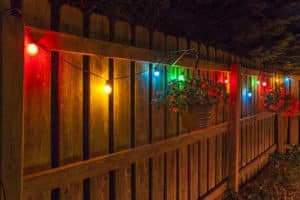 ChristmasLightsEtc shows you in pictorials how to use rope lights (which come in a variety of colors and lengths) to line walk-ways, against the base of stone walls, and to add deck lighting underneath hand-railings! Truly stunning! 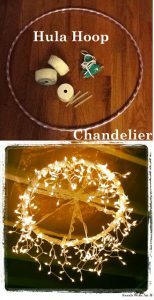 Here’s a beautiful lit-up wreath that you can hang by your patio as a both a decoration and a beautiful light fixture! Use for Christmas, or why not all through the year? No doubt you DIYers are already pondering the many different ways you could design something like this – for the details on how this particular one was made, check it out here at Sunset.com. 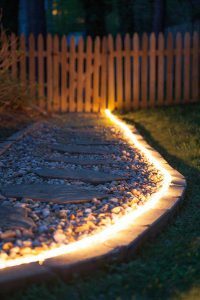 There is no end to the ways you can use long strands of patio lights to transform your patio space at night. 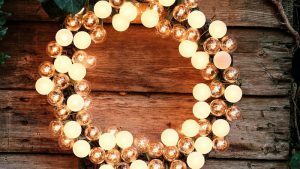 From the layout (V shape, zigzag, star, grid…) to the bulb type, size, and finish, whether you hang them on the ceiling, build a stand, or drape them in a tree, there’s just so much you can do! 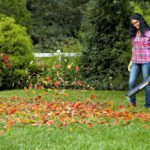 Want to get all the details and tips on figuring out what’ll work best for your space? 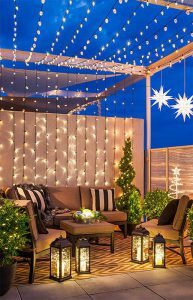 Check out “How To Plan And Hang Patio Lights” over at ChristmasLightsEtc. 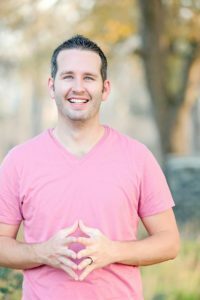 It’s incredibly comprehensive and covers all the details and options! 4. Add a beautiful space heater that doubles as ambiance lighting! Some nights spent outside on the patio can be a bit chilly. 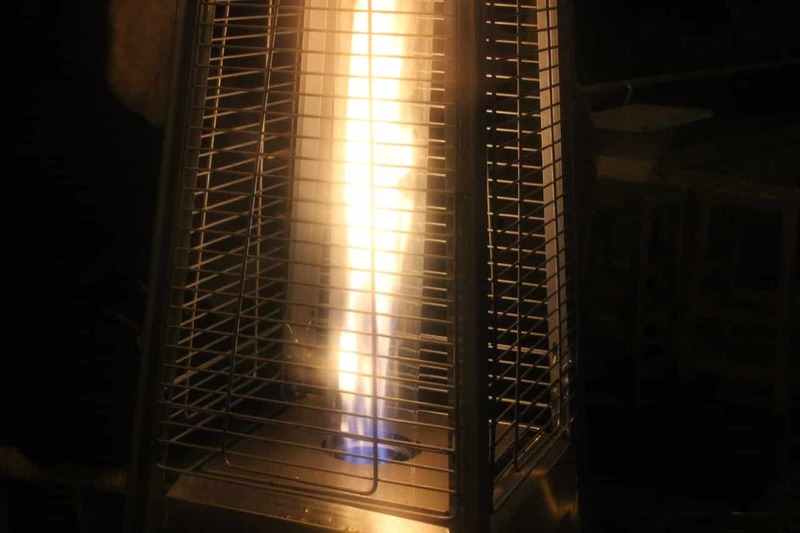 Warm up your guests with a lovely pyramid-style patio heater – these propane heaters have a glass tube in which the flames dance… throwing off beautiful lighting and of course, some welcome heat. 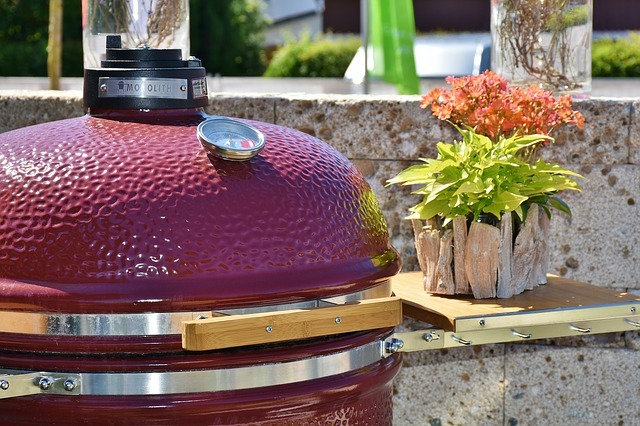 See: Best Patio Heaters 2018 for some top quality options. 5. Fill up a birdcage with lights (after you let the birds fly free). 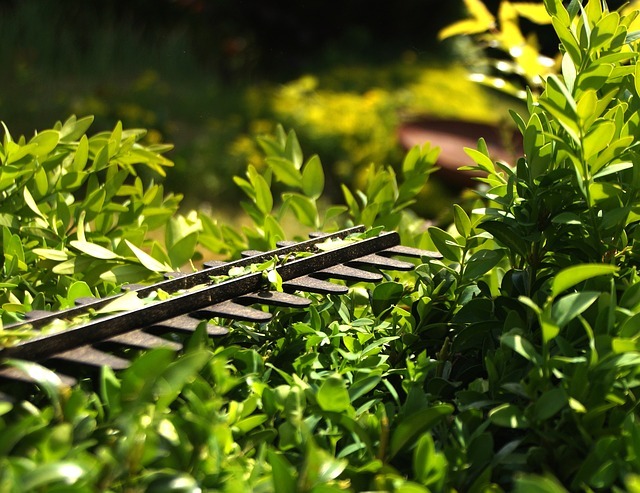 We love this idea by GardenTherapy – use a metal birdcage (preferably something interesting looking, an antique, or something just plain beautiful), and fill it with waterproof, battery-operated LED lights. 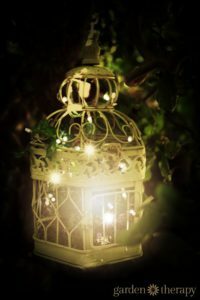 Aglow perched on a rock in your garden or hanging from a branch in a tree, it’ll creative some whimsy and fun as you and your guests pretend to have caught a collection of fairies! 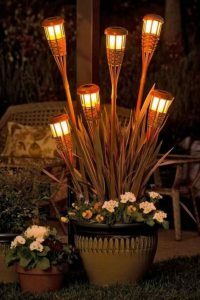 If you’re looking for something simple and fun, you can easily DIY a ‘Tiki Torch Bouquet’ by placing some battery-operated torches into a tall planter. Play with heights, colors, and styles to make your illuminated bouquet interesting! (Pic from Pinterest, source unknown). 9. Wrap up your trees in lights! Although in this picture (from Weddings By Lilly) the trees are in the middle of the yard, why not bring this idea back towards the patio and light up the trees (or pergola posts?) 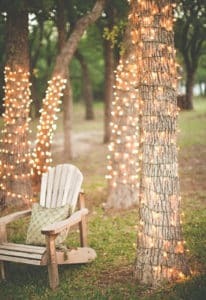 by wrapping the trunks (or pillars) with long strands of white lights? It sets a romantic ambiance and is very inexpensive to do! 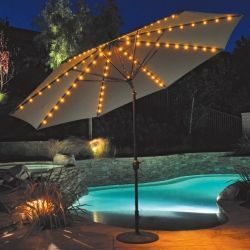 Isn’t this such a whimsical outdoor patio lighting idea? A fabulous DIYer at From The Blue Shed turned 2 old wire baskets and a length of mini lights into this beautiful statement piece that young and old will admire! 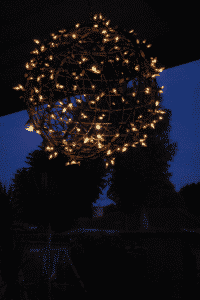 She calls it “A Fairy Light Globe” – a perfect name for it, no? 11. Add some pops of color! Sometimes “less is more”… and sometimes “MORE is more!” This is one case where more lights means more beauty, more flare, and more EVERYTHING! You and your guests will love being cocooned by the soft lights if you set them up like in the photo! Built yourself a frame and get to hanging! Photo Pinterest, source unknown. If you’re looking to DIY some sort of chandelier for your patio roof rafters, why not check out this idea at Sarah With An H ? With some very simple tools (hoop, lace, lights, glue gun) and some DIY talent, Sarah has designed herself a chandelier that’s a really romantic conversation piece… and a lovely fixture that will add some beautiful light to her porch! 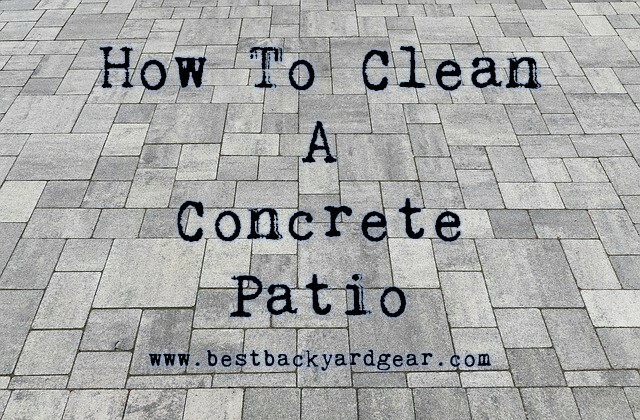 Ready to make your patio a place you don’t want to leave? 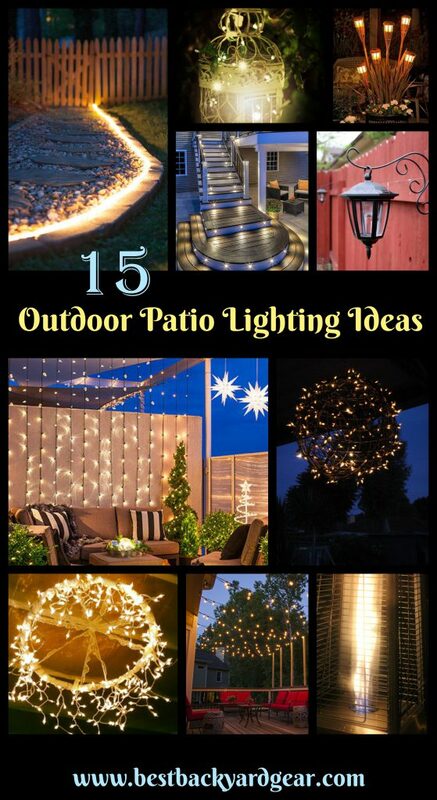 Any of these outdoor patio lighting ideas will be a nice addition to your space! 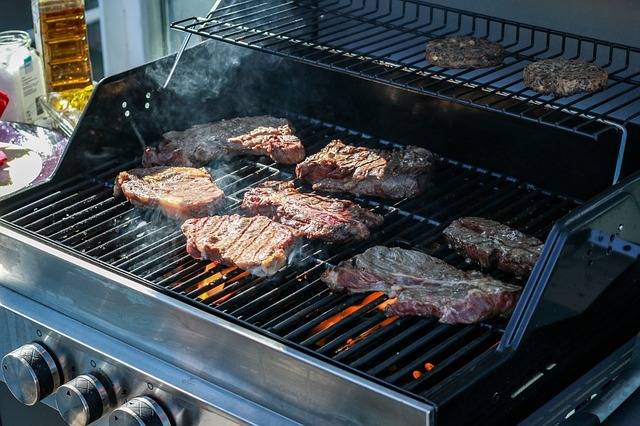 Do you have a favorite you’re going to try?